Veliky Ustiug, the home of Russian counterpart of Snata Claus - Grandfather Frost.Photos by William Brumfield. The town of Veliky Ustiug is well known as a treasure of northern Russian culture and, more recently, as the home of the popular holiday figure “Grandfather Frost.” Located on the left bank of the Sukhona River, the town combines a rich ensemble of historic architecture with a natural setting of remarkable beauty. Less known, however, is the presence just across the river of the Trinity-Gleden Monastery, whose main church contains an enormous icon screen that is one of the great works of baroque religious art in Russia. Statues of angels, putti and divine figures hover around elaborately carved frames for dozens of icons painted in the style of the Italian Renaissance. This miraculous display originated in the wealth of local merchants who made substantial donations to Ustiug’s monasteries. Although the development of St. Petersburg in the 18th century lessened Ustiug’s significance in transportation and trade, the town continued to prosper as a regional mercantile center. Ustiug was also highly regarded for crafts such as leather and metal working, as well as the production of fine enamel objects. In particular, its silversmiths developed specialized skills in the niello technique, and their work was in demand not only in the north but also in St. Petersburg, including at the imperial court. These commercial ties to cities such as St. Petersburg led to a familiarity with the lavish decorative forms of 18th-century religious art. As a result, Ustiug’s major monastery churches had gilded icon screens that display a northern interpretation of the European baroque style. The Trinity Monastery is situated some five kilometers to the southwest of Veliky Ustiug on the opposite, high bank of the Sukhona. Established at the ancient settlement of Gleden no later than the middle of the 13th century, the monastery consisted of wooden structures (including three log churches) for the first four centuries of its existence. 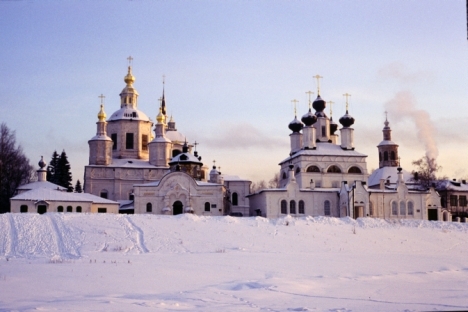 The monastery’s earliest masonry structure was the rebuilt Trinity Cathedral, begun in 1659 with donations by Sila and Ivan Grudtsyn, among Ustiug's wealthiest merchant families. Financial and legal difficulties after the death of the brothers halted construction for much of the 1660s until 1690. The structure, with its five cupolas and a separate bell tower in the west, was finally completed at the end of the 17th century. The exterior is imposing, but without the elaborate façade ornaments typical of other 17th-century Russian churches. The appearance of the interior is also restrained, with no frescoes and only two massive piers (instead of the usual four) supporting the ceiling vaults and domes. This carefully balanced structural design permitted greater natural illumination, so necessary for seeing the details of baroque carving. The wondrous icon screen, framed with five rows of intricately carved and gilded wood, took almost a decade to create, from 1776 to 1784. The soaring wooden structure conceals the altar space in the east and rises to a crescendo at its center, with flanking “wings” on either side. These three parts form a seamless whole, from north to south along the east side of the interior. The masterful carving includes extensive statuary that amplifies the church's guiding motif, dedicated to the ministry and Passion of Christ. The style of the icon painting imitates that of Italian masters, particularly noticeable in depictions of the Virgin. To the right of the Royal Gate (to the altar) is a large icon of the Old Testament Trinity--to which the monastery is dedicated. The ultimate source for this combination of florid baroque and classical elements is St. Petersburg, yet numerous other 18th-century Russian churches displayed a similar style. For example, the town of Totma, located on the Sukhona River some 200 kilometers to the southwest of Veliky Ustiug, was known as a center of northern Baroque. Indeed, the contract for the icon screen at the Trinity Monastery identifies the primary master craftsmen as residents of Totma. But even Totma, whose Baroque church interiors were barbarously ransacked during the Soviet era, had nothing to compare with the complexity of the iconostasis at the remote Trinity Gleden Monastery. Within the Trinity Monastery's unfinished brick walls there are two other churches: the refectory and Church of the Tikhvin Icon of the Virgin, completed in the 1740s; and the infirmary Church of the Dormition, built in the 1740s over the monastery’s west gate. In 1841 the small, secluded monastery with its unimaginably beautiful treasure was closed, only to be reopened in 1912 as a convent. After the revolution, the nuns existed precariously as an agricultural commune until the convent was disbanded in 1925. From that point, the former monastery served various grim uses, including a refuge for orphans and a detention center for juvenile delinquents. From the 1930s it was also used to house exiled peasant families and indigent elderly. The interiors of the Churches of the Presentation and Dormition were completely vandalized, although their exteriors remained intact.